Level: Beginner, have never skied before. You learn how to control your skis, to break, stop and turn. We also learn how to use the button lift. Level: You can stop and turn and can use the button lift. Snöstjärnorna develop their skills in more demanding terrain. Level: You can stop and turn and can use the button lift. Most of the ski area is explored and we use the T-bar lift and work on our technique and start learning how to ski with parallel skis. 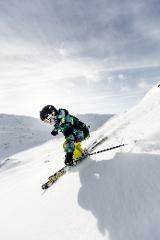 Level: You ski with parallel skis with good speed and control. We ski all over the mountain and work on our technique. 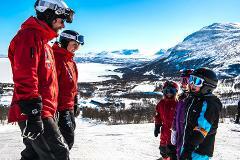 The highest level in the children´s ski school. Get the most out of your lesson with your own instructor who will focus on developing your skiing. The lesson can be shared by up to eight people in a group.